After a grueling ordeal yesterday, which involved loading the contents of my third floor, two-bedroom apartment in Albany into a ginormous U-haul truck, driving said truck to Daisy’s studio apartment in Woodside, Queens, and once again loading up the truck and then driving to Kew Gardens, Queens, and unloading the truck and getting everything up to the third floor, I felt the need to bird today. Fortunately for me our new apartment, not coincidentally, is a mere three blocks from a great park, Forest Park, 274 acres of which is the Forest Park Preserve, the largest continuous wooded area in Queens. Because Daisy and I are still not unpacked I had to limit my time spent birding so I walked quickly to the park in the bright sunshine and entered it from the northeast and went straight to the “water hole,” the only part of the park I had ever visited (that was a year-and-a-half ago when I tried, and failed, to see a vagrant Black-throated Gray Warbler). The birds were numerous and active! In just a couple of minutes I spotted an Eastern Towhee, tons of White-throated Sparrows, White-breasted Nuthatches, Northern Cardinals, Red-bellied Woodpeckers, Tufted Titmice, Black-capped Chickadees, a Downy Woodpecker, a Blue Jay, Mourning Doves, and American Goldfinches. I found a convenient log to sit on and just watched the birds feed in the leaf litter and along the edge of the mostly-frozen water hole. It was like therapy after the hectic day of moving on Saturday. Then, as I sat and enjoyed the common birds, a Brown Creeper flew out of nowhere and landed on a huge tree directly in front of me. Of course I took out the camera and got a couple pretty darn good shots of this cryptically-colored creature. 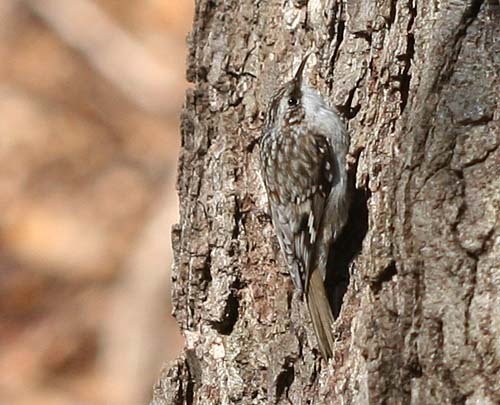 Considering that my best ever shot of a Brown Creeper before today was the one in this post, well, I was pretty happy. 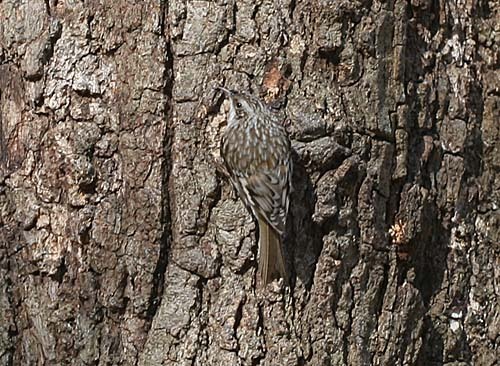 Not only was I happy about the pictures I got, but I was also pretty enthused by the fact that both the Brown Creeper and the aforementioned Eastern Towhee were new birds for my Anti-Global Warming Big Year. While watching the creeper creep up the tree I caught some motion in my bins through the bare branches overhead. 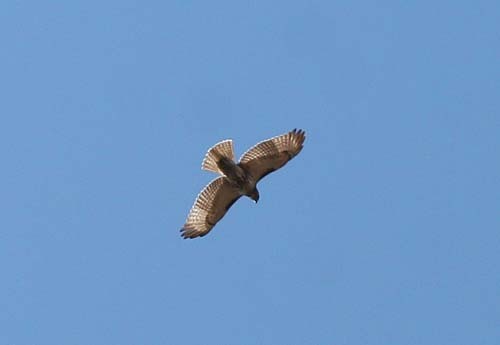 A Red-tailed Hawk was flying over and it let me get a single clear shot before branches obscured it. Hopefully I will eventually get a better shot of the urban hawks of Forest Park. After watching for more birds at the water hole for awhile I took a quick walk through the park, mostly to learn my way around it a bit better. Dark-eyed Juncos were the only other bird that I added for the day but I’m sure that over the coming months I will see many species of birds in Forest Park, my new local patch. Oh, and many, many, many, thanks to George, Leanne, Will, my parents, Marcella, Kerry, Sabeen, Althea, Steph, Sean, Scott, and Tim, who all gave freely of their time and sweat to see Daisy and I successfully moved into our new place. We could not have moved all that stuff without you guys (especially that $#! * couch). Glad you got settled in. Albany isn’t the same without you. I wish you and Daisy all the best! And the first vagrant you find at Forest Park, you know I’ll be there! Such an amazing day you had and stunning photos of these Brown Creepers! BRAVO! There are some good birds to be found in New York City. I’m glad you caught up with the creeper. Great photos! I don’t know, Corey! You, in the big city? Hmmm, strange thought, might take a while and some good birding posts for me to get used to. @Will: Thanks again for your help…and it’s a two-bedroom so you know there is room to crash. @Monarch and John: Thanks! The creeper was so cooperative it was scary. @Jochen: Tell me about it…but no longer owning a car and being able to read on my train ride to work is wonderful. That and having a singing Carolina Wren outside my window this morning might make this whole city-living thing tolerable. Corey, can’t you see, you’re losing your grip already!! You’re supposed to BIRD on your daily train ride!! P L E A S E !!! Corey, come back to us! If only my train ride were above-ground…I guess I could look for Cave Swallows though! Nice thinking guys, but I’ll probably have to be content with rats.